Cloud watching is more than a hobby. These fluffy features in the sky play a vital role in warning you about upcoming weather conditions. Take for example anvil dome clouds. Have you heard about this type of cloud? If not, then you should be interested in knowing what type of weather it brings. Read further. As the name suggests, anvil dome clouds are clouds that take the form of anvil clouds but come with a dome-like structure on top of the anvil. The dome-shaped formation is often referred to as penetrating top or overshooting top which extends all the way to the stratosphere. Despite their small size and shorter life span, they can produce extremely powerful and dangerous weather conditions such as damaging winds, hail, tornadoes, heavy rainfall and snow. 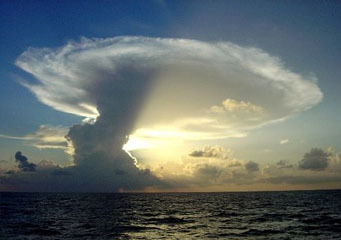 Anvil dome clouds are found in thunderstorm clouds usually in cumulonimbus clouds. Cumulonimbus clouds occupy low and middle level altitudes from 500 to 13,000 feet above the ground. But in severe cases, it can grow up to 75,000 feet. Cumulonimbus clouds are the parent clouds of anvil clouds and overshooting clouds. Let’s start off with the anvil cloud formation. An anvil cloud forms when the updraft or rising warm air of a thunderstorm spreads out horizontally when the surrounding air is either warmer or about the same temperature as the ascending warm air. Overshooting top develops when the rising warm air projects beyond the equilibrium level, the moment when the temperature of surrounding air equals or even warmer than the rising air. The projection beyond the equilibrium level is due to the strong atmospheric instability. Overshooting tops look like cauliflower or bubble cloud structures on top of the smooth anvil cloud. As what have been said earlier, anvil dome clouds or overshooting tops are short-lived. But if one is visible for over 10 minutes and is very big, thick and puffy, it is a strong indication of an advancing severe thunderstorm. Anvil dome clouds are common worldwide although they are rarely visible in Antarctica. In addition to bringing severe weather condition, overshooting tops also convey strong air currents which could pose some concern to the aviation industry. Catching an anvil dome cloud appear on top of an otherwise smooth anvil cloud is quite fascinating. But you should be cautious and take note of its size, appearance and how long it lasts for it can signify a strong incoming thunderstorm.